...that the SPARTAN-IIs received extensive theoretical education in the Reach Naval Academy? ...that Modular Dispersal Technology is a compartmentalized design philosophy employed on Forerunner and Covenant starships? ...that the escape pod from Halo: Combat Evolved is called the Bumblebee? ...that humorous messages can be found written on the Assault bomb in Halo 2? This article contains information about a fan-made subject that is not considered a part of the official Halo universe. Halo 2600 is an action-adventure video game developed for the Atari 2600 video game console, inspired by the Halo series of video games. 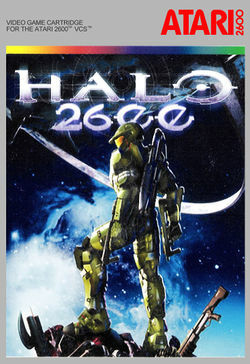 Halo 2600 was written by Ed Fries, former vice president of game publishing at Microsoft, who was involved in Microsoft's acquisition of Halo developers Bungie Studios. It was one of four new Atari 2600 titles released by AtariAge at the 2010 Classic Gaming Expo in Las Vegas, including Duck Attack!, K.O. Cruiser (a boxing game) and a port of Sega's 1981 arcade game Turbo. According to Fries, he was inspired to write an Atari 2600 game after reading the book Racing the Beam: The Atari Video Computer System by Ian Bogost and Nick Montfort. The player uses the joystick to control the character of the Master Chief as he makes his way through 64 screens, divided into four zones: outdoors, covenant base, ice world, and a final boss area. (A complete map of all the boards, enemies and weapons has been posted to the web. See external links.) Weapons and power-ups are available to combat the many enemies that appear. There are two upgrades in the game. Both are guarded by what appears to be nine enemies but is actually three. The first is a gun with a faster rate of fire. The second is a pair of boots that allows you to move faster. In addition to these the player can obtain energy shields from killing various enemies that will take one shot to prevent the loss of one of the player's three lives. After successfully completing the game once, the game returns to the menu screen, but has a red sky. If you choose to play again from that screen the game is in "Legendary" mode where the player goes through again, but this time they start out moving and shooting slower.